The Blinder Road 3's mount consists of a built-in silicone strap, which can stretch to most handlebar sizes. There's an included replacement strap with a larger diameter. Both straps use a metal clasp to hook around the handlebars and secure the light in place. 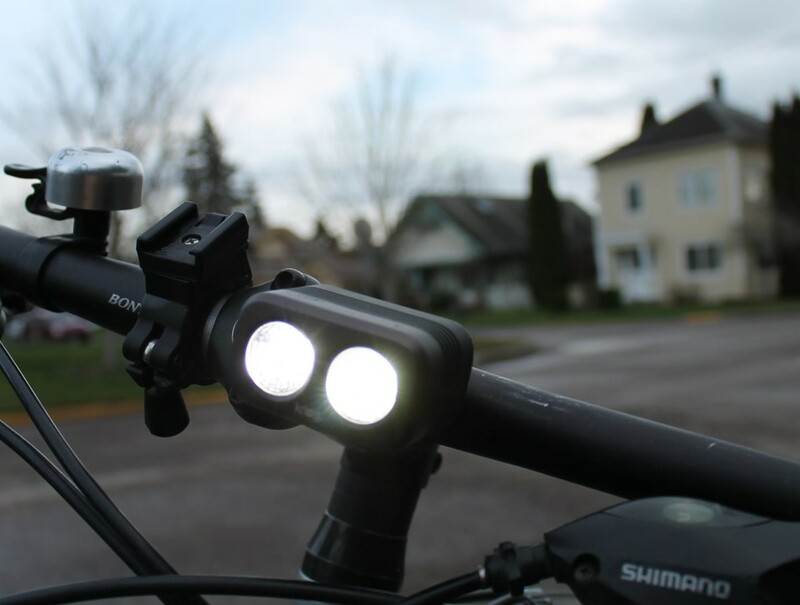 The mounting feels secure – the light doesn't bounce or lose its position when riding on bumpy roads. It's also very easy to remove from the bike, and perhaps the simplest light to move between bikes. The light holds two LEDs, one behind a wide-angle lens and the other behind a spot lens. One button on the back allows you to switch power level between low, medium, and high. The other button lets you choose between using both LEDs at once, only the spot, only the flood, alternating flash, or one LED on steady and the other flashing. While the ability to switch between beam patterns seems nice at first, in reality you'll almost exclusively use the light with both LEDs turned on to their highest setting. The light simply isn't that bright. It reaches a maximum of 300 lumens when both lights are at their highest setting. I think 300 lumens is adequate for many riders, but this is less light output than most of the competition in this price range. What's worse, the light only lasted 25 minutes on its highest output before automatically cutting back to the medium brightness level, and lasted a total of under 2 hours even after dimming itself. 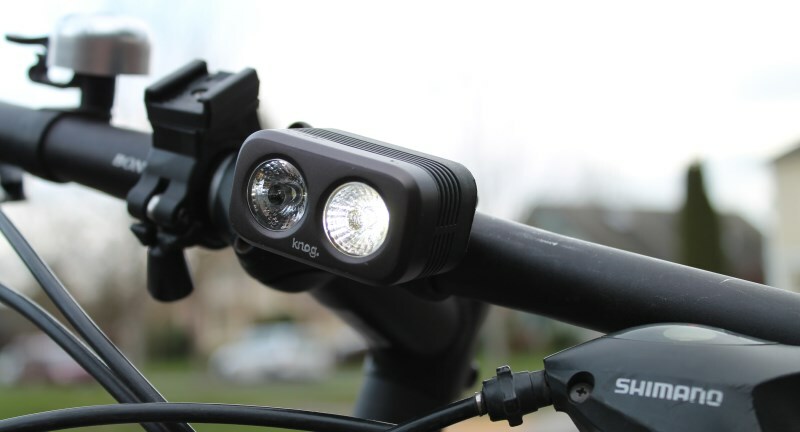 Side visibility is also sorely lacking - as its name implies, the light is suitable for road riding, but it's not a good choice as a be-seen light. Almost no light is visible at all from 90°. As is common these days, the Blinder Road is USB rechargeable. Unlike other lights that require an external cable though, the Blinder plugs straight into a computer or USB power jack with its built-in USB plug that flips out from the bottom of the light. It's a nifty design that ensures you're never without the charger, but in practice the plug is so short that it's often impossible to actually fit the light up against a computer just right to get the plug in. 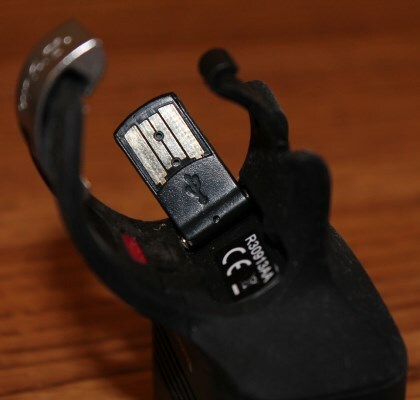 Fortunately, Knog does provide a short USB extension cable, which solves this problem nicely. Overall, the Blinder Road 3 is certainly a classy light, but it seems that the functionality of the light was compromised by the focus on aesthetics and design. A less sleek light with a longer battery life is ultimately going to be more practical. As LED efficiency and battery technology improve, future iterations of this design may become more compelling.